One of the funest games the night of Post Prom is "The College Wheel". Test your knowledge by answering trivia questions and win college swag of your choice! We solicit from over 1,000 colleges and universities across the US for free college wheel prizes. We typically receive t-shirts, sweatshirts, pennants etc., but more and more colleges are sending less and less each year. 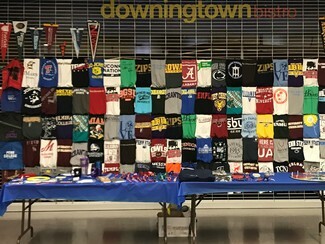 Help us round-out the selection by choosing to grab a t-shirt or two from your alma mater, or from a more popular school (Penn State, West Chester, Univ. of Pitt. etc.). Donations can be dropped in the Main Office at anytime labeled Post Prom.